I just know that this time around we'll all be super-friends (trade mark !) and the day will end with us all slurping a cocktail through a straw from the same hollowed-out pineapple ! *giggles and gushes* to one and all ! Gordon wrote: Confession #2: I am going to bed. Once in a brownish-purple moon, I consider the thought I may be colourblind. 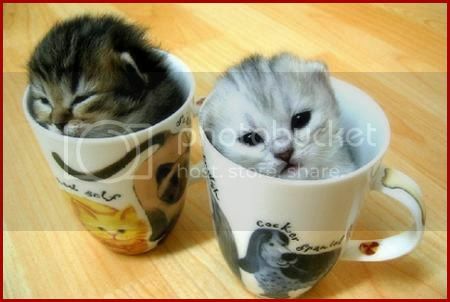 blue_eyedspacemonkey wrote: Tea and kittens. Tea. Kittens. What more could you want? I realize that combining the two may not always result in optimal circumstances ! So dispense with the tea, and keep the cup ! Balesk Baj, Timeburner wrote: I just noticed lately that whenever I see the word traveler, my brain reads it as time traveler. I add ", Timeburner" to everyone's name, thanks to you ! Would it not be wonderful if Mr. Grylls married Prof. Patrick R. Hugg ? I once made a similar joke about Whoopi Goldberg and Peter Cushing. The answer to both of those is 42, of course ! Oregonaut wrote: There are no "half" uncles. You can have a step-uncle, but not a half-uncle. But what if he has no arms and no legs ? Where does the mare in the lair keep its pink hair? You have a Super Day now ! The Cat wrote: Louie is funny. You have posted over 70 YouTube® Videos in your long and illustrious career and I've loved them all ! The world is a much nicer place now. Just like finding a cake with frosting on it, then sharing with your friends ! Tra-la-lally ! Hello everybody! I'm the happiest person on the fora ! 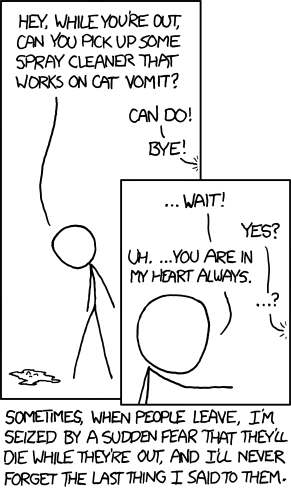 I love xkcd and everyone who reads it !